5. 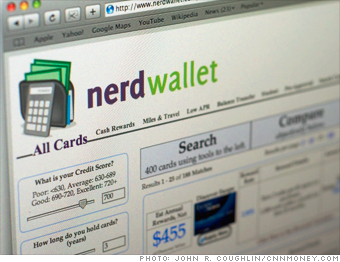 Is it time to dump my rewards card? Now that a new law makes it harder for card issuers to charge tricky fees, some are getting less generous with the rewards they dole out. This site, founded by a Stanford-educated hedge fund analyst, combs through 400 cards to find the best one for you. Enter the amount you generally charge each month, what kinds of things you buy, and your estimated credit score. Presto: a list of cards that will maximize your rewards. You can also search for the best low-rate or balance-transfer cards. Coolest feature: Filter results by the kind of rewards you prefer -- say, airline miles or cash back. Try this too: The credit card comparison tool at Billshrink.com. Its database doesn't include as many cards, but it lets you sort results by tons of features, such as 24-hour customer service. NEXT: 6. How can I cut spending and save more?